Earlier this morning, 20th Century Fox played sly and announce a new Deadpool movie. They didn’t give a title, nor were they forthcoming with what this is actually going to be. It will hit theaters on December 21, taking the old release slot once held by Alita: Battle Angel, which has been bumped to February. Fox told fans to guess hard, but it wasn’t long before the new Deadpool movie was revealed to be a recut version of what fans got in theaters this summer with Deadpool 2. Only this version is going to be rated PG-13. And it features Fred Savage. 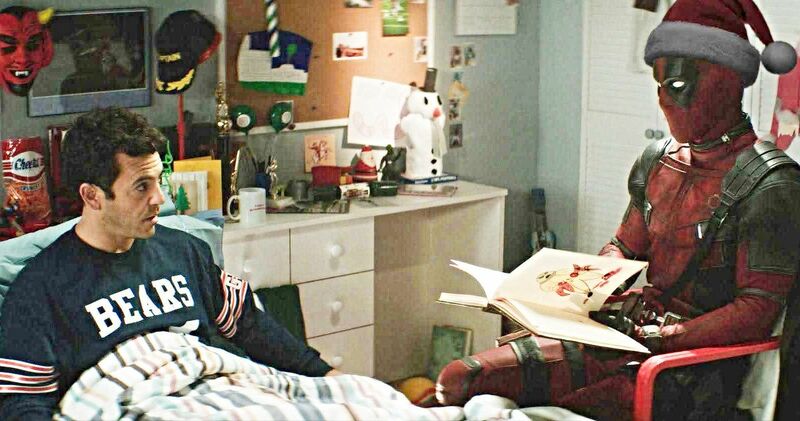 Shortly after Fox announced Deadpool 2 was returning to theaters in a much more family friendly PG-13 version this Holiday season, so that all you degenerate parents can take the kiddies, Ryan Reynolds shared a photo from the recut that features Fred Savage as the Grandson from The Princess Bride, albeit much older, lying in bed, wearing his iconic Chicago Bears football jersey. Deadpool is seen at the foot of the bed, reading Savage a bedtime story. A Santa hat on his head, it’s not too hard to figure out that Wade Wilson is reading the grown-up grandson from The Princess Bride a watered down children’s book base on his alter ego’s superhero exploits. Interestingly enough, when the Super Duper Cut, which puts a whole lot of raunchy jokes back in the extended version on Blu-ray, hit Target, it actually came with a Deadpool 2 storybook not unlike the one Wade is reading allowed. No further details beyond this picture shared on Ryan Reynold’s Twitter have been announced. The idea is to take out all the R-rated jokes and violence, water it down, and release it for safe consumption as a holiday treat. The story will be retold in The Princess Bride style, and it may even incorporate footage from both Deadpool movies. Whether Fox realizes it or not, this is kind of a slippery slope. If Deadpool 2 arrives in theaters this Christmas with a PG-13 rating and it turns out to be a huge hit financially, that might be Disney’s queue to turn the whole franchise into a PG-13 affair moving forward. It at least gives them cause for the change. It isn’t known if there is any other additional material being shot for Deadpool 2. And it hasn’t been mentioned if they will use black censor bars and bleep sounds to cover up the more aggressive scenes, if they are ADRing new less-offensive dialogue, or if this was always the plan from the get go, and they already have PG-13 rating scenes shot and in place. It’s not an uncommon practice for movies to shoot less offensive scenes during production, for use in Airplane cuts and the version that will run on TV. There is a great featurette on the original Superbad DVD release that shows how those all come together, so its possible that additional footage has already been shot and edited, and Fox is pulling a sly one by dumping the Airplane version in theaters to earn a couple extra bucks off a proven blockbuster with a few new wrap arounds added, all for the holiday season. Here you go, sucker! Merry f’n Christmas.